Egyptian military scouring the Mediterranean Sea on Friday found the wreckage of the crashed EgyptAir aircraft, including a body part, seats and some items of passengers' luggage, a day after the ill-fated plane en route to Cairo from Paris went down with 66 people on board, with authorities hinting at a terror angle to the deadly incident. “Egyptian aircraft and navy vessels have found personal belongings of passengers and parts of the wreckage 290 kilometres north of Alexandria,” Brigadier General Mohamed Samir said on his Facebook page. In Athens, Greece's defence minister Panos Kammenos said a body part, seats and some items of luggage were found by military crews searching for the wreckage of the jet. The military searchers had intensified their search for the missing EgyptAir Flight MS804 after earlier reports that its wreckage had been found turned out to be false. The discovery of the wreckage near the Mediterranean coastal city of Alexandria comes as the navy continues to sweep the area looking for the plane’s black box and bodies. There were no signs of survivors after the Airbus A320 “swerved and then plunged” into the Mediterranean. The plane, on its fifth journey of the day, was travelling at 37,000 feet when it disappeared from radar. It had made a stop in Tunisia before flying to Paris. Soon after the wreckage was found, the Egyptian presidency expressed its “deep sadness and extreme regret” over the deaths of the people on board the jet, in the first official recognition of the tragic crash of the missing plane. 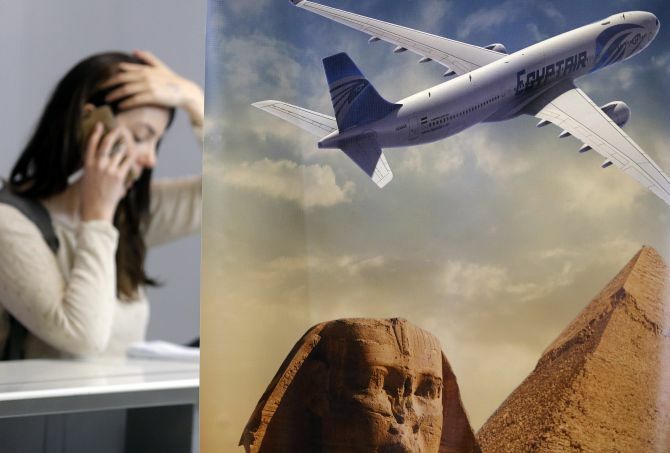 The plane lost contact with radar early on Thursday above the Mediterranean Sea about 280 km from the Egyptian seacoast at 02:30am (local time) as the flight was expected to arrive CairoAirport at 03:15 am (local time). The plane was carrying 56 passengers and 10 crew: two cockpit crew, five cabin crew and three security personnel. EgyptAir said two babies and one child were on board. Among the passengers were 30 Egyptians, 15 French, two Iraqis, and one person each from the UK, Belgium, Kuwait, Saudi Arabia, Sudan, Chad, Portugal, Algeria and Canada. The Egyptian navy, air force and army were searching the sea to the north of Egypt’s coast, with French, Greek, British and US support. The plane made “sudden swerves” before dropping off radar over the Mediterranean, Greek defence minister Panos Kammenos said. It made a 90-degree turn left, and then dropped from 37,000 feet to 15,000 feet before swerving 360 degrees right. The airline, identifying both the captain and co-pilot, said that captain Mohamed Said Shoukair had 6,275 flying hours, including 2,101 on the A320; while the copilot, Mohamed Mamdouh Ahmed, had 2,766. The plane was manufactured in 2003. Egyptian Civil Aviation Minister Sharif Fathi said technical failures and terror each are possible explanations. “But if you analyse this situation properly, the possibility of having a different action aboard, of having a terror attack, is higher than having a technical problem,” Fathi said. The tragedy raised fears of a repeat of the bombing of a Russian passenger jet by the Islamic State over Egypt last October that killed all 224 people on board. French President Francois Hollande on Thursday said that it was clear the plane had crashed, and authorities in both Paris and Cairo opened investigations. In a statement issued by Sisi’s office, he also ordered an investigative committee formed by the civil aviation ministry to immediately start probing the causes of the plane’s disappearance. He ordered the civil aviation ministry, the army’s search and rescue centre, the navy, and air force to take all necessary measures to locate debris from the jet. Investigators now need to unravel the mystery why the plane swerved suddenly and plummeted into the sea. French and Airbus investigators prepared to meet their Egyptian counterparts in Cairo to lay the groundwork for their probe. French Foreign Minister Jean-Marc Ayrault told French television there was “absolutely no indication” of why the flight came down. “We’re looking at all possibilities, but none is being favoured over the others because we have absolutely no indication on the causes,” he said. In conflicting reports, EgyptAir initially said that Egyptian foreign ministry has “confirmed finding the wreckage” but later withdrew the claim. EgyptAir’s Vice Chairman Ahmed Adel had earlier told CNN that when searchers got close to debris found in the Mediterranean Sea they realised it did not come from the missing airliner. He added that maintenance checks on the plane had been done on time and “no snags were reported”.